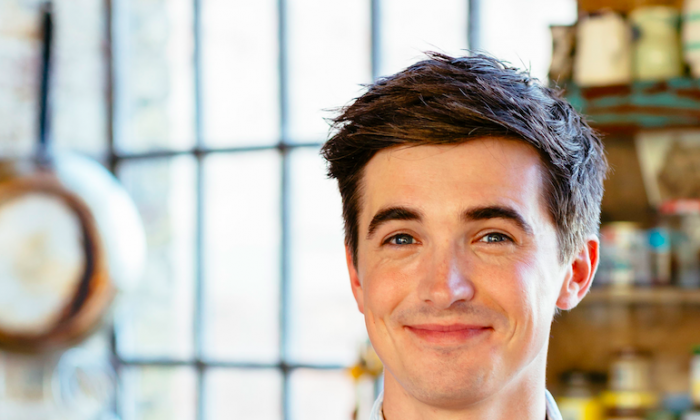 At the ripe young age of 27, after two years in a pop band and eight years in his food career, Donal Skehan hit a wall. Or rather, at that moment—feeling overworked, in the humid heat at a food market in Hanoi, Vietnam—he found a wall to hold himself up, to keep from falling. For years, he’d been burning the candle at both ends. The experience in Vietnam landed him in a hospital, where he had time to take stock of his situation, and what landed him there. 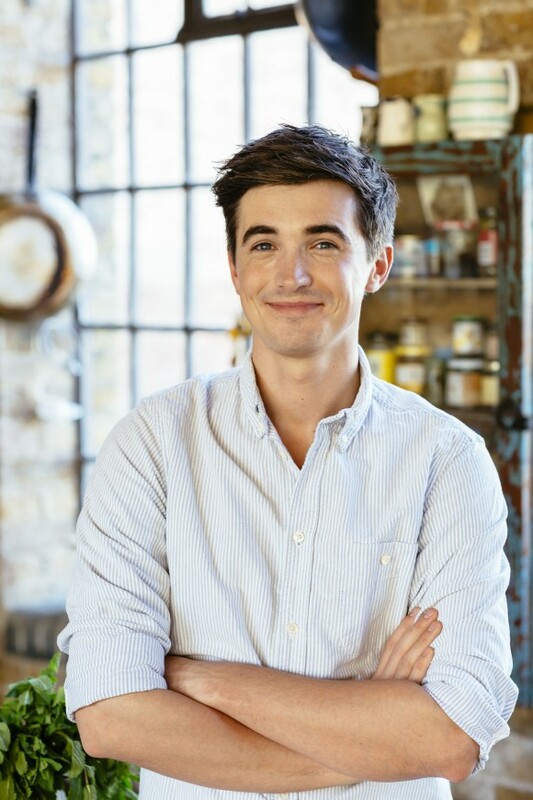 An Irish food writer, photographer, and TV presenter, Skehan, now 30, is a relatively new face to American television viewers, as the co-host of “Food Network Star Kids” with actress Tia Mowry. But he is already well-known on the other side of the pond. Since he started a food blog, his career has been one nonstop adventure fueled by nonstop work—much of which has taken him to different corners of the globe to film television shows. He has won over nonnas in Italy with his tiramisu; tried snails in Vietnam; and traveled to Sweden, north of the Arctic Circle, to make Christmas rice pudding. “I started when I was 21. I just got catapulted into this world,” he said. “Very few moments did I actually stop and decide what I wanted to do next and how I wanted to live life—and I think everyone comes to that point at some point in their life. I think for me, I just had to stop; I came to a stop.” Still, Skehan views the hospital incident in a positive light. 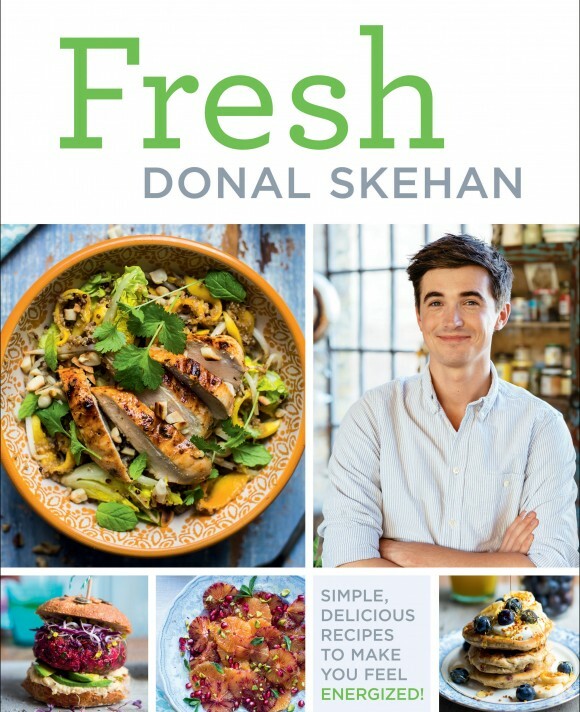 “Fresh,” published by Sterling Epicure, is actually his eighth cookbook—and though he’s Irish, don’t go looking for traditional Irish recipes in it. The closest you’ll get is probably his vegetarian Sweet Potato Shepherdless Pie. The book is divided into a variety of recipes for breakfast, lunch on the go, quick suppers, and healthy snacks—and the photography, by Skehan himself, is mouthwatering. It is a cookbook for busy people, with vegetables and grains at the forefront. 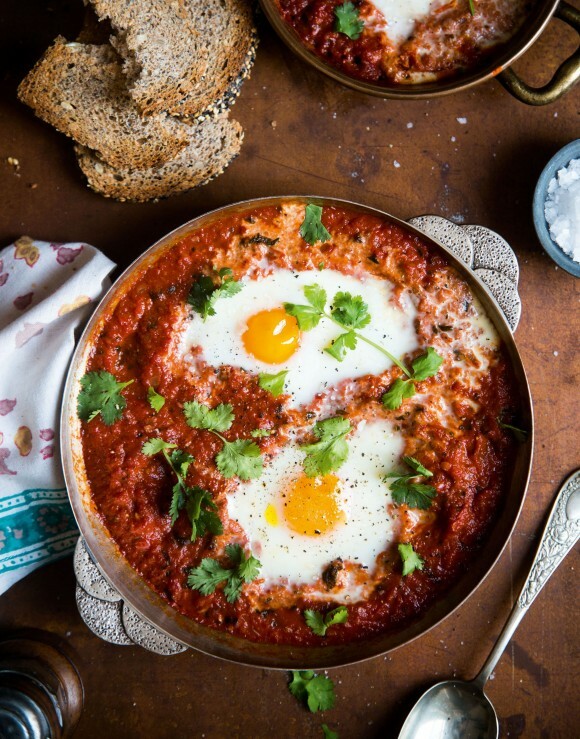 A recipe for Harissa Baked Eggs riffs off shakshuka and is a cinch to prepare (unless you’re like me and get chili in your eye). The spicy kick perfectly complements the eggs and tomatoes. 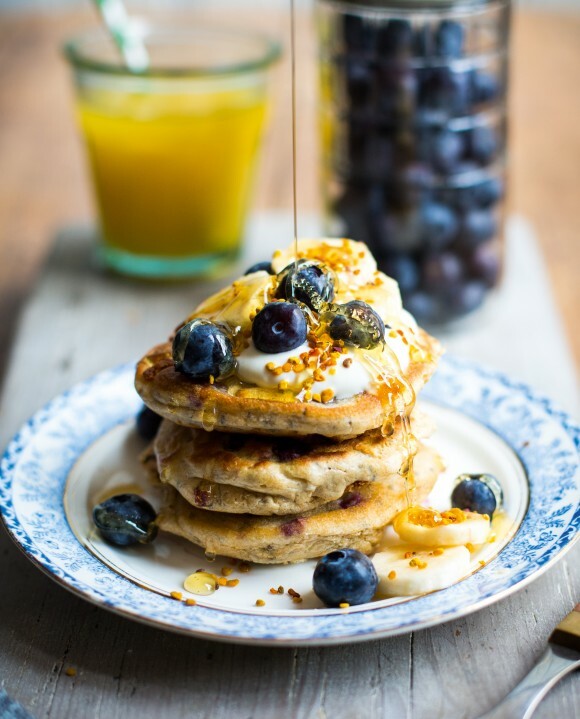 For another breakfast, Skehan pulverizes oats into flour and uses it to make pancakes, topped with blueberries, honey, yogurt, and bee pollen. It’s a delicious, hearty dish to eat virtuously; my family declared these the best pancakes they’ve ever had. Unlike many cookbooks that focus on healthy eating, Skehan devotes a substantial chapter to sweet treats—some, like the Carrot and Zucchini Cake, topped with a fragrant rosemary and orange crème fraîche, manage to sneak in vegetables. Others, like the green apple sorbet and the roasted rhubarb, are simplicity itself. The onus is always on taste. For example, Skehan uses coconut oil here and there, not so much for its reputed health properties, but because its taste works well with the other ingredients. There are bold flavors aplenty—a chapter at the end is devoted to what he calls “flavor makers,” items that elevate a dish, like spiced yogurts, pistachio dukkah, and chickpeas roasted with a sprinkling of cayenne, smoked paprika, and cumin. In “Fresh,” you can clearly see the influence of his travels, including his adventures in Vietnam, a place that gives him continued culinary inspiration. “I’m just blown away by the street food. What’s most fascinating is that you meet these street vendors and all they do is one dish,” he said. “You could meet a lady who’s been doing this one dish for 40 years. You’d be hard pressed to find chefs in any part of the world, in any restaurant, that have cooked one dish every single day. On “Grandma’s Boy,” his favorite of the TV series he has worked on for Fox International, Skehan traveled around Italy, cooking with grandmothers. “Every town I would go to, I would meet the grandmother who was the best cook in the town,” he said. “That was a really true experience. Again, like those street food vendors, [there was] just something that is so inherent in what cooking should be: It’s about the family,” he said. For him, as simple as it may be, it’s his mother’s roast chicken—which she prepares with all the trimmings for Sunday dinners—that he always remembers. A few months ago, Skehan left Dublin for Los Angeles, settling in with his wife Sofie, whom he works with, and his border collie Max. Family, too, provides grounding and support. And in true Angeleno fashion, he’s embraced hot yoga.